SAN FRANCISCO (May 3, 2010) – Espolón™, the super-premium tequila that evokes the storied culture of “real Mexico,” is returning to the U.S. market. Skyy Spirits, the U.S.-based wholly owned subsidiary of Gruppo Campari and the definitive marketer and distributor of super-premium and luxury spirits brands in North America, is proud to bring this 100-percent Weber Blue Agave tequila brand north of the border again with a new look, yet with the same award-winning liquid. Espolón was originally introduced in the United States in 2000, garnering praise from Tequila experts and winning a Double Gold Medal at the San Francisco World Spirits Competition as well as a Platinum Rating by the Beverage Testing Institute. Gruppo Campari, who in 2009 bought the Espolón brand along with the San Nicolas Distillery where it is made, is reintroducing the brand following a three year hiatus in the US. Inspired by classic nineteenth century artwork and the iconic rooster, a symbol of Mexican national pride, Espolón imparts true stories of life in real Mexico. Handcrafted with estate-owned Weber Blue Agave, these heralded premium tequilas are distilled in the Los Altos region of Jalisco, Mexico, and made at the artisan San Nicolas Distillery under the guidance of Master Distiller Cirilo Oropeza. Two marques are now available in select US markets, Blanco and Reposado, both represent an outstanding value at a suggested retail price of $24.99 for a 750ml. 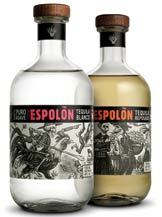 Espolón Tequila Blanco ($24.99 750ml)— The color is clear with a platinum cast. On the nose are aromas of delicate, sweet agave, floral notes, tropical fruit and lemon zest with a hint of pepper. In the mouth there is a soft feel, light- to medium-bodied palate with bright agave flavor, and notes of pepper, vanilla bean and grilled pineapple. An elegant, clean finish ends with a hint of spice. 40% ALC. /VOL. Espolón Tequila Reposado ($24.99 750ml)— The tequila displays a rich, golden-hued color with aromas of spice, caramel and a hint of chocolate. The expressive nose gives way to a bold, round mouth-feel with a medium-dry, full-bodied palate including rich roasted agave, sweet tropical fruit, and intense vanilla and brown spices. The flavor finishes slowly with a sweet, spicy fade creating a hedonistic reposado with añejo-like wood spiciness. 40% ALC. /VOL. 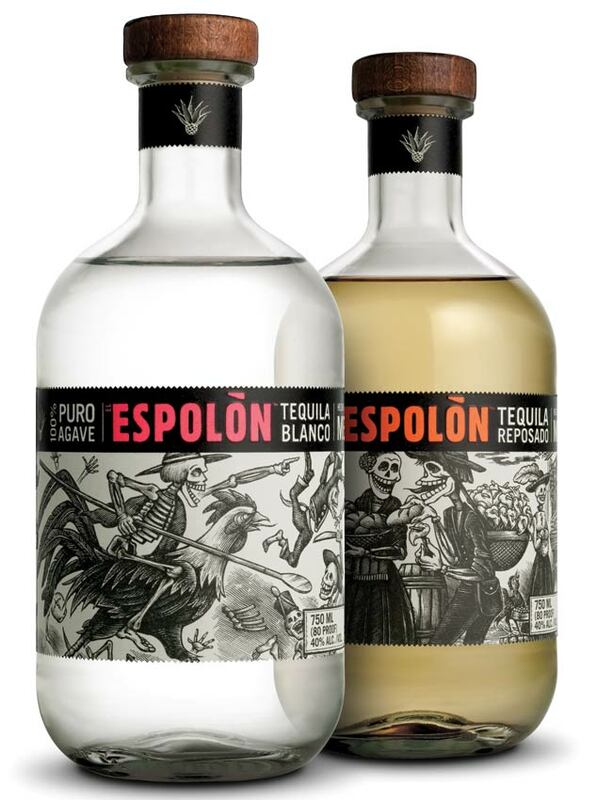 While Espolón’s liquid remains the same, the packaging and look/feel of the brand have been redesigned and repositioned, with a focus on trumpeting life in real Mexico. The new decorative label on each Espolón bottle pays tribute to the Mexican artists who inspired the world with true portrayals of the country’s rich history and complex everyday life. Striking, stark block print artwork features the characters of Guadalupe, Rosarita and the proud rooster, Ramón, reliving Mexico’s rich cultural stories. The Espolón Blanco label, entitled “Independencia,” illustrates Guadalupe and Rosarita joining Father Miguel Hidalgo’s valiant campaign for Mexican independence from Spain. The Espolón Reposado label tells the story of “recuerdo” (“remembrance”), in which Guadalupe and Rosarita grace the markets of Mexico City, the new metropolis built on the fallen Aztec capital. Here, the couple schemes to infuse elements of Aztec culture into every market to ensure the remembrance of that great society. The labels serve to provide history and offer insight into the rich and fascinating stories of real Mexico. Skyy Spirits, LLC is the US-based wholly owned subsidiary of Gruppo Campari (Reuters CPRI.MI - Bloomberg CPR IM) and the definitive marketer and distributor of super-premium and luxury spirits brands in North America. Launched in 1992 with the introduction of its flagship brand, SKYY® Vodka, Skyy Spirits has grown exponentially, building a portfolio unrivaled in its quality, innovation and style, making it a top choice among distributors, retailers and consumers. Skyy Spirits manages Gruppo Campari’s portfolio in the US of such leading brands as SKYY® Vodka, SKYY90®, SKYY Infusions®, Campari®, Wild Turkey® Straight Kentucky Bourbon, American Honey®, Russell’s Reserve®, Glen Grant® Single Malt Scotch Whisky, Cabo Wabo® Tequila, Espolón™ Tequila, Ouzo 12®, X-Rated® Fusion Liqueur® and Jean-Marc XO Vodka®. Skyy Spirits is also the exclusive US distributor of Cutty Sark® Scotch Whisky, The Glenrothes® Single Malt Scotch Whisky, Bowmore® Islay Single Malt Scotch Whisky, Auchentoshan® Lowland Single Malt Scotch Whisky, Glen Garioch® Highland Single Malt Scotch Whisky, Flor de Caña® Rum, Carolans Irish Cream®, Tullamore Dew Irish Whiskey®, Irish Mist® Liqueur, Midori® Melon Liqueur, ZEN Green Tea Liqueur TM, Hibiki® Whisky and The Yamazaki® Single Malt Whisky. Skyy Spirits was founded and is headquartered in San Francisco, California. More information on the company can be found at www.skyyspirits.com <http://www.skyyspirits.com> and www.camparigroup.com <http://www.camparigroup.com> . Please enjoy Skyy Spirits brands responsibly and in moderation.